LOUISVILLE, Ky. (Aug. 30, 2018) – The Kentucky Bourbon Trail® Welcome Center and The Spirit of Kentucky® exhibition has officially opened at the Frazier History Museum in downtown Louisville on historic Main Street. Located on the first floor of the Frazier and founded in partnership with the KDA (Kentucky Distillers’ Association), the KBT® Welcome Center will be the Official Starting Point of the KBT® tour. A professional concierge service will help visitors plan their trips to Bourbon distilleries throughout Kentucky and navigate the hot spots of Louisville’s burgeoning Bourbon, culinary and nightlife scenes. Visitors will also get to test their knowledge of alcohol and responsible drinking by taking a DRINKiQ quiz. Admission to the KBT® Welcome Center will be free of charge. The Spirit of Kentucky® exhibition is a visual guide to the history, craft and culture of Kentucky Bourbon. Located on the third floor and accessible with the cost of admission, this permanent exhibition celebrates the “Enchanted” elements of Kentucky that promote Bourbon-making: water, limestone, soil, grains and wood; the “Gracious” nature of Bourbon industry leaders and the “Refined” culture of Bourbon consumers. Highlights include the covered bridge-style walkway, which features 4K footage of Red River Gorge and Cumberland Falls; the “Gracious Table,” a family dinner table with an interactive surface that contains a voluminous digital library of Bourbon-related research content, including lithographed maps of historic distilleries and interviews with Master Distillers; and the “Bottle Hall,” a bottle collection that includes every brand of Bourbon currently produced in Kentucky. Artifacts include antique farm tools, whiskey stills, model riverboats and vintage Bourbon bottles. Visitors can simulate barrel-making and sample aromas found in Bourbon such as lactone, caramel and vanilla. A modern new entrance and public park have just opened on the east side of the building in the space between the Frazier and the neighboring structure at 823 W. Main St. Among the new features are “the Cube,” a large glass vestibule with an entrance on Main Street, and the “Gateway Garden,” a linear outdoor park with native Kentucky plants and stairs that lead to a rooftop garden with a balcony. A sliding gate installed on the north end of the property will remain open during museum hours, providing access to the park and museum from Washington Street. The Weber Group collaborated with Jon Carloftis Fine Gardens on the project. Carloftis is a world-renowned landscape artist from Lexington. 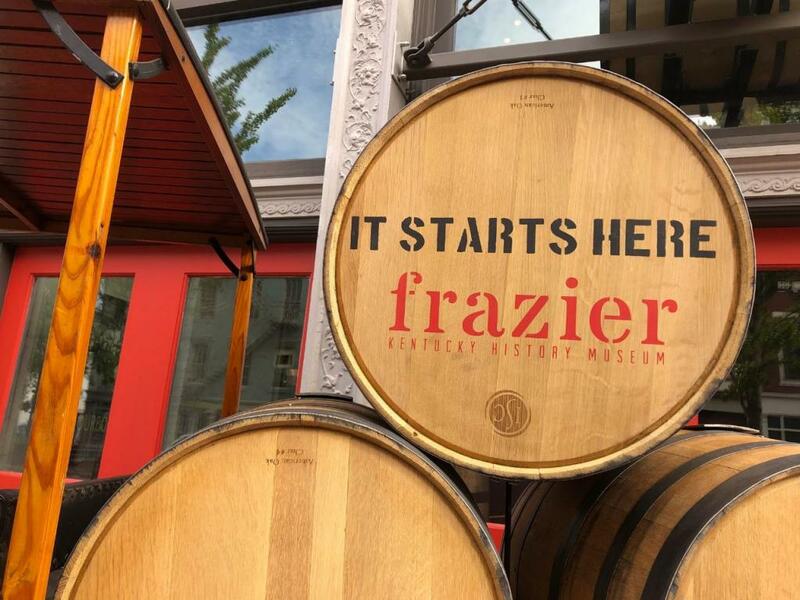 In addition, the Frazier will play host to more Bourbon-related programming, including tastings, classes, bottle signings and speaking events such as The Masters Series and The Dusty Bottle Series.